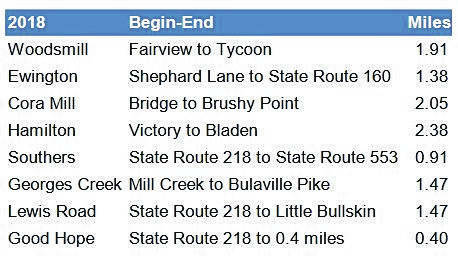 The following roads will receive fresh blacktop in the coming weeks. GALLIA COUNTY — The Gallia County Engineers Office is gearing up for more paving projects throughout the summer. Residents along the roads scheduled for paving are already seeing roadwork being done as crews work to proactively replace and repair sections of roadway before paving starts. In 2017 the County Garage paved 18.76 miles of roads in Gallia County, which was reduced to 11.97 miles despite goals to do more. Boothe explained that the reduction in roads being paved is a result of budgetary constraints at the county commissioner level. The county needs to resurface 30.5 miles of county roads per year to maintain a 15 year life cycle. Using funds from revenue and grants, the county averages 12 miles of re-surfacing per year. That is a shortfall of 18.5 miles or $1.85 million for resurfacing county roads every year. Paving will begin around the end of July and will last about three to four weeks, according to Booth. The bid has already been put out and accepted, although it is still pending official approval and has not been awarded. Josh Waugh, a local contractor has been doing the work replacing culverts. https://www.mydailytribune.com/wp-content/uploads/sites/42/2018/06/web1_road-stuff.jpgThe following roads will receive fresh blacktop in the coming weeks.